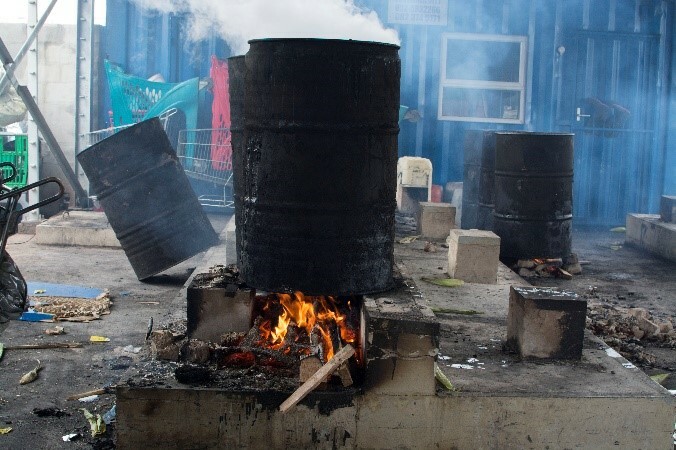 “Qeda usizi” end our suffering: improving the lives of street cooks – Part 1. Home > Occupational Health & Safety > “Qeda usizi” end our suffering: improving the lives of street cooks – Part 1. Freshly cooked mealies (corn-on-the-cob) are an essential Durban street food staple – they’re healthy, affordable and conveniently accessible to the local commuter population. 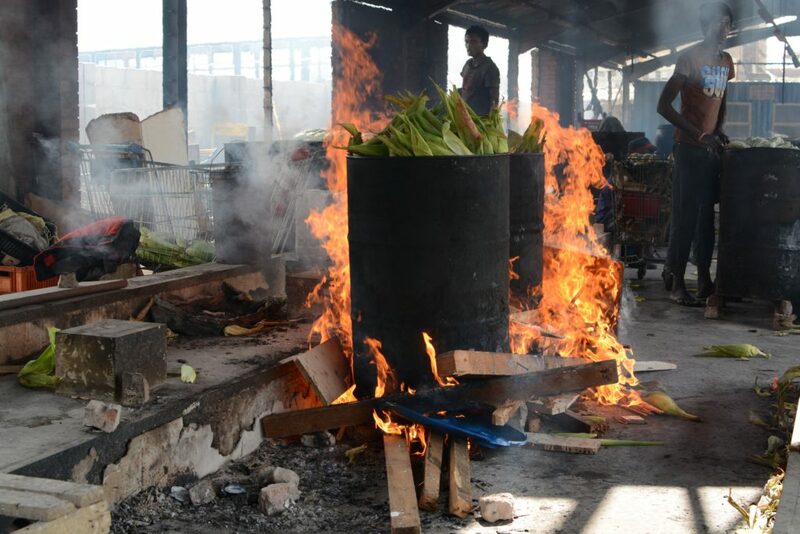 Over the years, the preparation of mealies in the inner city has developed incrementally- from the hazard of large open fire cooking on city pavements, to a designated site and most recently a City built cooking facility. 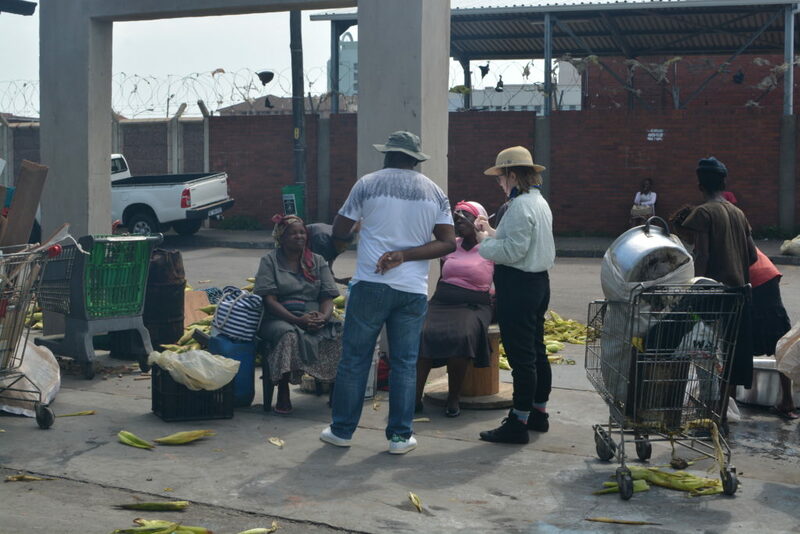 However, the process of preparing the mealies in a way which is less harmful to the environment remains a complex challenge for both mealie traders and City managing authorities. Current method of intensive cooking on open fires. A number of workplace safety and public health challenges emanate from the rigour and robust nature of the cooking practice. These are amplified by the complexities observed in seasonal dynamics of product and cooking fuel supply chains and economics, the skill and labour intensity of industrial cooking on open fires, the politics of self-organised networks, as well as the precarious street trading conditions. The improvement of the working conditions of informal traders therefore requires strategic and integrated interventions at varying scales. 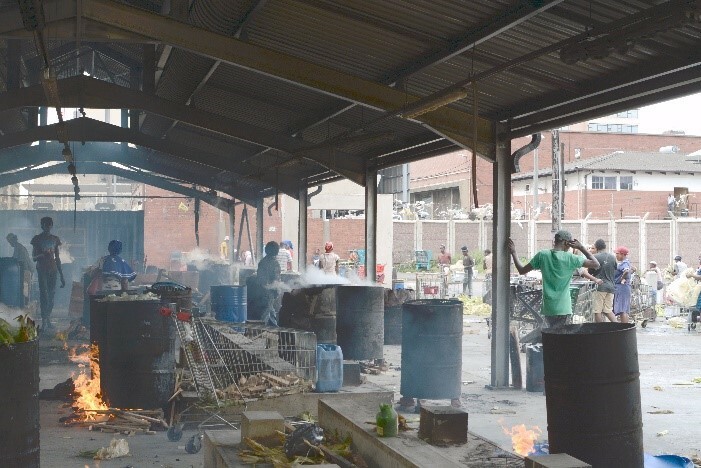 The recently built cooking facility, continues to raise worker’s health and safety concerns, due to the heat and smoke trapped under the roof, and the high plinths from which the drums are rolled off. Obtaining understanding and establishing the nature of the cooking challenges was acquired through various approaches which included both ‘street’ urban intelligence (including contextual observation and user engagement) as well as technical considerations, both social and scientific. 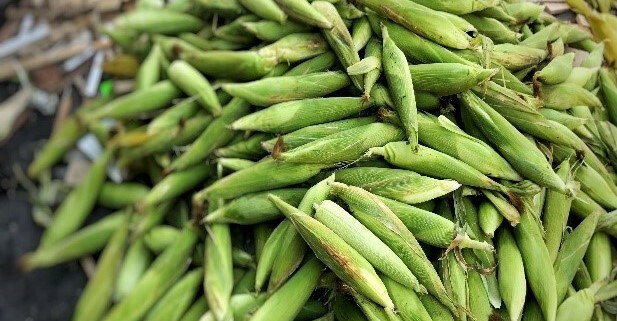 Specifically, mealie cooks were observed and interviewed on the how and why of their cooking practice and the information gathered was then evaluated against scientific calculation where necessary. Key insights included the limitations the stove design would have with regards to appropriate materials and fuels (ie. 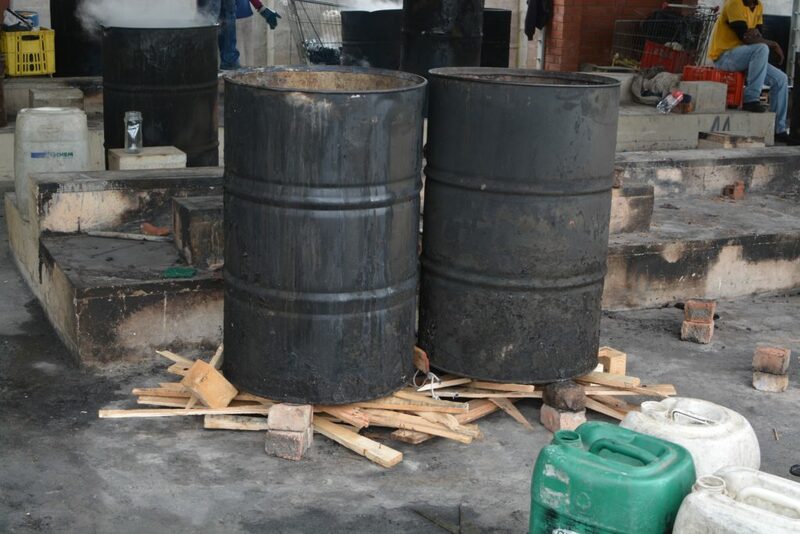 most efficient materials with a lowest street value- to discourage theft in the absence of capital and reliable security), such as the mild steel drums, on the three stone fire cooking currently used. Another key aspect was around possible trade-offs and non-negotiables for the cooks, such as maintaining or improving cooking time efficiency, in the process of improving smoke emission and fuel efficiency. Whilst the provision of basic infrastructure such as shelter the development of informal trade practices requires a holistic consideration, which includes understanding and a critique of the tools and technology used for practice. A collaborative approach, such as this, which is both technical and scientific and user-centered, provides various lenses through which the challenge can be dissected. In this exercise it meant a broader scope of permutations for the appropriate technological response could be explored, and yet narrowed down to the few most effective options, which required minimal intervention with the most substantial and sustainable impact.